Capsicum annuum unless otherwise noted in variety description. 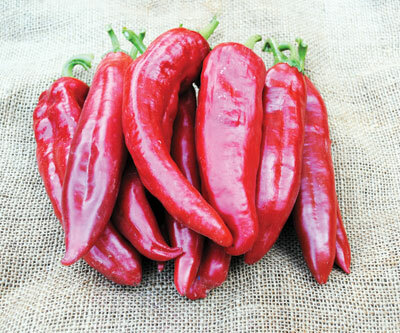 Other pepper species include C. chinense and C. baccatum. How to Grow: Sow seeds 8-10 weeks before planting out after last frost. Plant seeds 1/4 in. deep in well-drained soil in shallow flats. Maintain soil temperature at least 75-85 degrees F for good germination. Peppers won't germinate in cold potting soil--heat makes a big difference in seeds germinating in 5 days, or seeds taking up to 20 days! (Since germination can be slower if seeds don't have enough heat, make sure to sow extra seeds in case germination is low.) Don't overwater seeds or they may rot. Transplant to 3 in. pots as soon as several leaves have developed. Maintain day temperature 75-80 degrees F, and night temperature at least 65 degrees F. Water plants with warm water. Transplant again to larger pots if the seedlings become too large. Peppers need to have an uncrowded root system or subsequent yields will be reduced. Harden the plants by giving them plenty of light and setting them outside for a few hours on warm days. Be careful not to let the plants wilt. Don't rush the season: a good rule of thumb is to transfer peppers to the garden after the dogwood blossoms have fallen, or when average soil temperature is 65 degrees F or above (usually a month after last frost). Space plants 18-24 in. apart in rows or blocks. Wait a month to mulch peppers so that the soil can heat up. Small-fruited varieties tolerate hot humid conditions better than large-fruited varieties. Once flowering begins, fertilizer should be withheld; otherwise, flowers may drop without setting fruit. Other factors causing flower drop are low humidity (sometimes caused by wide spacing), poor pollination, full fruit set, or night temperatures above 80 degrees F or below 65 degrees F. In the greenhouse, pollinate peppers the same way tomatoes are pollinated. Maintain high levels of phosphorus for sustained yields. Once fruit production begins, short stakes or small tomato cages may be necessary to prevent large-fruited varieties from falling over. Flavor: Peppers are fully ripe after turning color. Although all peppers may be eaten in the green stage, ripening to red, yellow, etc. increases flavor and nearly doubles the vitamin C content. Extended Harvest: Mature plants have good vigor in fall, so cover plants on frosty nights for 1-2 weeks to extend the harvest season. Then, before the first killing frost, uproot plants and place the roots in a bucket of water and store in a cool location to extend harvest by one month, or grow the variety Doe Hill Golden Bell, an excellent keeper. Diseases: Peppers are fairly disease-resistant, but are susceptible to anthracnose, bacterial leaf spot, and tobacco mosaic virus (TMV). Use resistant varieties and control aphids. TMV may not kill plants but will greatly reduce the yield. Keep cigarettes out of the garden and greenhouse. Physiological Diseases: Sunscald is common on varieties that have sparse foliage. Blossom-end rot is less common in peppers than tomatoes, and is due to inadequate calcium supply or uneven supply of water. Greenhouse Pests: Similar to treatment of tomato pests. Seed Savers: Wear gloves when collecting seeds from hot peppers. Isolate sweet varieties by 150', and hot and sweet varieties by 300'. Note: Days to maturity are days after transplanting. Dates are for green peppers; for ripe peppers, add a month.